In a large pan, fry the onions and garlic in the olive oil. Add the pork and veal, then fry for 15 minutes while breaking up the ground meats. Season with salt and pepper. Add the potatoes, spices, chicken broth and the maple syrup, then continue cooking for 15 minutes. Remove from the heat and leave to cool. 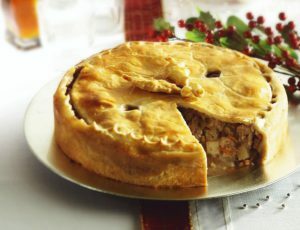 Set the tourtière filling aside. Season the pork fillets with salt and pepper. In a large skillet, fry the fillets in butter over medium heat for 3 to 5 minutes each side, to desired doneness. Remove from the pan and leave to cool. Set aside. In a bowl, beat the egg with the milk. Set aside. On a floured work surface, roll out the puff pastry to make two 50×25-cm (20×10-in) rectangles (1 base and 1 crust). 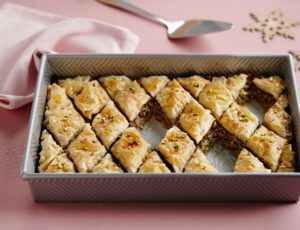 Place one of the pastry rectangles on a baking sheet lined with parchment paper. Spread the tourtière filling on the pastry base, leaving a 2.5-cm (1-in) space from the edge. 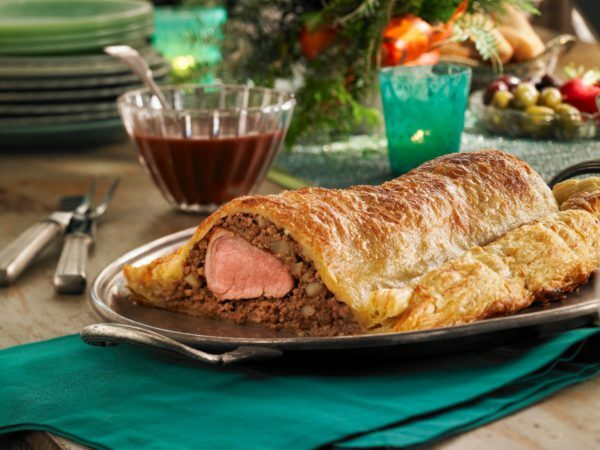 Then place the pork fillets end-to-end on top, and cover with the second pastry rectangle. Brush the egg and milk mixture around the edges and seal the pastry. Cut a few slits on the top of the tourtière, brush with the remaining egg and milk mixture, and then sprinkle with the maple sugar. Bake for 20 minutes, then reduce the heat to 180 °C (350 °F) and continue baking for a further 10 minutes. Remove from the oven and set aside while you prepare the red wine and maple vinegar sauce. In a small pan, melt the butter and fry the shallots for 5 minutes. Add the flour, then add the remaining ingredients. Season with salt and pepper. Reduce to a smooth consistency, then strain. 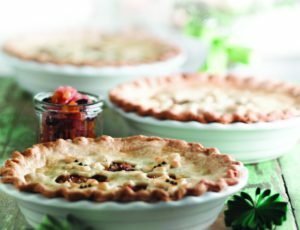 Pour the sauce over slices of the maple-laced pork Wellington tourtière.